Four luxurious villas in a privileged location 50m from a private beach. The clear blue sea and exclusive beach bar equipped with sun loungers and sunshades will satisfy the most demanding sea and sun worshipers. With facilities and services comparable to luxury hotels only with more privacy, each villa has spectacular views, peaceful atmosphere and very modern amenities, perfect for restful holidays. Villas are designed for families, couples, newlyweds and those with exquisite taste who can appreciate the tranquility, comfort and luxury of these unique villas. What makes the villas so special? Staying in a private sea front villa and enjoying your own private beach facilities is very special! Feel the freedom of staying in your own villa but also take advantage of the “hotel style services” that we can offer if you want or need them. Created with high standards and branded goods and materials, provides “comfort and luxury in every detail”. Private beach with a luxury beach bar and sun beds “on the water” for each villa. Complex was designed with child safety in mind, offering a variety of facilities for children to occupy them and leave parents the needed space to relax. We offer a consistently memorable experience! We organize unique boat trips on Crete a great experience in a great price only for our guests. On these excursions you have the chance to swim to the most beautiful beaches of Greece, to see the gorges of South Crete, to see the rare Kri Kri (Cretan goats) and the unique wild nature of Crete. Please ask us for more information. Rethymno is an ideal town for bicycles because combines rarely united features the old town's charm and history, with proximity to a long sandy beach. With your bicycle you can visit in few minutes the Fortezza (fortress) which was built by the Venetians, the Archaeological museum at the entrance to the fortress, the Venetian Loggia which is dating back to the 16th century, the folkloreand history museum, the main minaret (Neratze mosque), the Rimondi fountain and also to buy fresh products from ''Laiki" (the local market). In the old town of Rethymno you will find everything from traditional bakeries, cafes, taverns and also a variety of shops in the street of Arkadiou, Souliou and Ethnikis Antistasis. It is a great advantage to rent a bicycle and after roaming in the small streets of Rethymno to be in the long beach in just few minutes! For our guests we rent special bicycles in a special price. Please ask us for more information. If one wishes to have the pool heated, this will be done for the complete period of stay. At extra costs of € 35,-- per day. Outdoor Fenced Heated swimming pool with hydro massage jet Sun beds Sun umbrellas Pool alarm Automate night lightning Private sun beds on the beach Beach toys BBQ station from Porphyritic Dining table Garden park Parking space Vegetable garden* Children playground* Indoor Satellite HDTV High speed Wi-Fi Fully air-conditioned Sony bluetooth speaker Private washing machine Iron / Iron board Hairdryer Full-length mirror Safe box Baby cot / Highchair King size Cocomat beds Pillow choices Bathrobes / Slippers Wardrobes Beach towels Jacuzzi bath Nintendo Wii Board games Kitchen "Smeg" Fridge / Freezer 4 ring ceramic top cooker Microwave Oven Dishwasher Nespreso coffee facilities Filter coffee machine Toaster / Kettle / Lemon squeezer Modern kitchen extractor hood “Compac" worktop Dishes / Utensils Dining table Our sumptuous beds are unique to the Thalasses Villas. Made by Coco-Mat, one of Greece’s leading bed manufacturers, they are made of entirely natural materials. Coco-Mat beds consist of multiple layers of natural materials, from renewable sources, such as coco fibre, natural rubber, wool, cotton, sea grass, horsehair, silk, linen, wood and goose down, providing optimal, elastic and orthopedic support to the human body. The mattresses are suitable for all body types, particularly persons of heavier weight. The quilted mattress cover is made from cotton and wool and is Eco-Tex certified (standard 100). It can be removed and cleaned. A top-mattress is the perfect complement to a bed-mattress. Our top mattresses are made of solid natural rubber foam. It is highly elastic, providing perfect support for all body types. Thousands of small holes permit ventilation, ensuring steady body temperature throughout the night. The luxurious outer cover is made from thick high-quality cotton. Using a special knitting technique, the cover provides additional padding to the top-mattress and is extremely soft to the touch. *** Heat and air cooling system: We heat the building through a combination of the solar thermal panels on our roof (water heated by the sun) with a heat pump. Ecological air cooling systems are used, avoiding traditional air conditioning systems, which are often harmful to one’s health. All the pipe work throughout the building is insulated. ****Televisions: Our televisions are the lowest energy models on the market. Using around 60watts (less than most traditional light bulbs). The picture output automatically adjusts according to the light levels in the room, further reducing the energy they use. Unlike most televisions, you can actually switch them off (using the button on the left hand side) and even when in standby they use minimal power. Toilets, showers and taps: The toilets in our bathrooms are dual flush and ultra-low water consumption. Our taps are aerated, as are the showers, giving the performance you would expect from a great shower but using a fraction of the water. Paint: The paint which is used for all the surfaces, is produced by the Greek company ”Vivechrom”. This company is located in Piraeus, has eco-label certification and their environmental friendly paint ”eco-neopal” is available all around the world. Unlike other manufacturers, they keep using natural ingredients such as Linseed Oil and China Clay instead of ammonia and formaldehyde. Wardrobes, desks & bedside tables: All the furniture is handmade. The wood’s natural beauty adds a warm and friendly design note and it makes the products extremely durable. They are treated with ecologically friendly stain and varnish. Improvements to thermal performance: The thickness of the walls is 30cm in which we have inserted cavity wall insulation between the outer and inner skin of the external walls of the building. Additional thermal insulation, volcanic pumice, has been added on the roof. All the windows are double glazed. Lighting: The lighting in the guesthouses is, as you would expect, all low energy. For the ceiling lights and the bedside lamps we use 7 watts bulbs (a traditional halogen light would typically use 50 watts). Re-cycle: Our guest house guides are made from recycled paper. We use only environmental friendly cleaning products and all our waste is separated and the vast majority recycled. 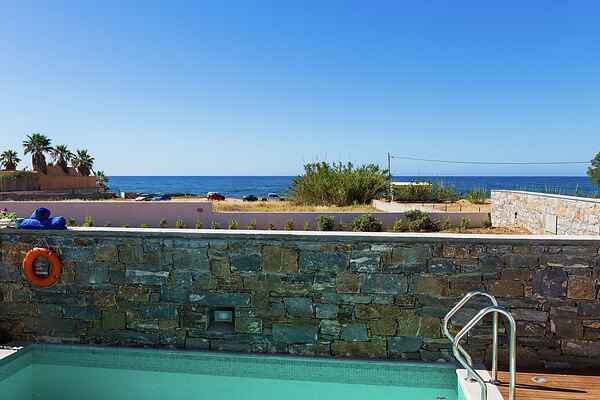 Outdoor Facilities Spacious private terrace with sea view BBQ station Swimming pool with hydro massage jet, heated in May and mid October, heated April and October extra cost. Sun beds and sun shades Shaded patio with day bed Jacuzzi Private parking Security service around the clock Other facilities on request & extra charge Private chef in your Villa, upon request, to cook your choice of local and international cuisine (24 hours notice) BBQ and waiter service (24 hours notice) Butler service on request, club car, private transfer on request, cocktail parties & children parties at your veranda and surroundings. Ask us for • Car, Motorbike and Bicycle rental service. • Private massage sessions by arrangement. • Laundry and pressing on request. • Food and wine tasting tour. • Walking and hiking tours • Cycling tour • Sailing trips. • Scuba Diving Adventures. • Water activities. • Rock climbing. • Horse Riding. • Fishing adventures with local fisherman. Food: Our philosophy is to promote the local biological-products directly from our neighboring suppliers such as vegetables, cheese, eggs, yogurt, honey and fruit. The ingredients are fresh, seasonal, and organic. We buy all our biological-products from small local producers around Crete.